GROHE Power&Soul has been awarded a Best Buy in the April 2014 issue of Consumers Digest – evaluated and rated on quality of construction, water usage, ease of use, range of features and style. Featured as the top midrange selection in the showerhead category, Power&Soul's diverse spray patterns range from a refreshing burst of water to energize and stimulate to soft restorative air-infused bubbles for a fully personalized shower experience every time. The innovative ‘One-Click Showering’ spray selector, as Consumers Digest highlights, allows you to change the spray setting by pressing one of four buttons. In addition to providing push-button access to four unique spray patterns: GROHE Rain O2, Rain, Bokoma Spray®, and Jet, Power&Soul provides another seven mix-spray combinations – for ultimate shower enjoyment. Power&Soul has received design awards from around the globe, including Good Design USA, IF Product Design Award and the prestigious Red Dot Design Award. Variety is the name of the game in terms of not only the spray patterns but also the available styles to choose from, including the architectural, minimalist feel of the flat and cylindrical Cosmopolitan model. The Power&Soul head shower and hand shower ensure a perfect match for every installation and need, while the matching body showers facilitate the creation of luxurious custom showers. Picking the right shower for every taste has never been easier. 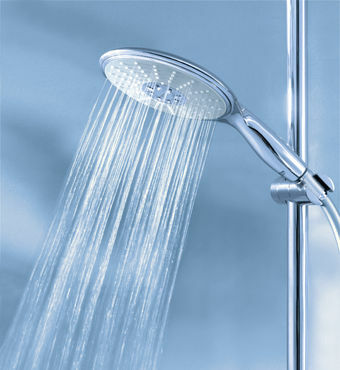 For more information or to find a showroom, please visit www.grohe.com/us. The new issue of Consumers Digest, which features a round-up of the best products for your home, is available on stands now. The GROHE Group employs some 9,000 people on average worldwide (including around 3,400 at Joyou). There are about 2,300 employees working at GROHE in Germany.